Whether it's a full-time home or a vacation cabin, this small home design is very inspiring. Planted out in the country, the little cabin feels very comforting and welcoming. The enclosed porch extends the length of the home and is lined with rocking chairs making it the perfect place to enjoy the lovely cool summer evening breezes. Since it's screened in, people can enjoy the outdoors without worrying about getting bothered by pests. There are a couple of access points into the porch area too which is a nice feature. Once in the porch, there are French doors with glass inserts welcoming you into the home which is spacious and open, with a modern eclectic design inside. The wood floors and ceiling really warm the space up, and the white walls freshen it up and make it feel more substantial. The living room is at the centre of the home with a large sectional couch, a warm Persian rug, a chair and a TV on an antique TV stand. The kitchen is a galley style kitchen with gorgeous stainless steel appliances and a massive ceramic farmhouse style sink. The main and only bathroom is located on the other side of the kitchen and is outfitted with beautiful double sinks, a shower and a flush toilet, plus some storage for linens and other items. The home also features not just one, but two bedrooms on the main floor as well which are both a great size, then there are also two loft spaces on either end of the small home too. The house has such a great design that makes it very practical for a small family or for a couple. 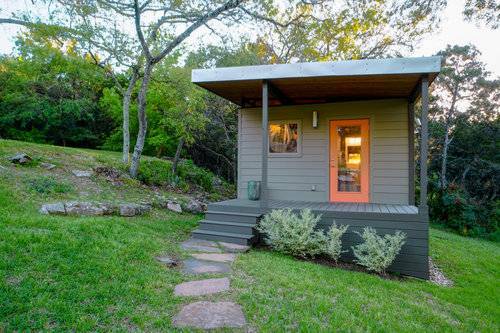 An adorable tiny house cabin that's worthy of some praise. This sweet little cottage has so much country charm starting with the cute front porch complete with comfortable Adirondack chairs. The home is painted in some pretty unique colours as well, which may inspire others to think outside the box when it comes to colours for their small house or cabin. The owners chose a lovely buttery yellow colour for the main exterior walls and then a bright red for the trim and accents. The Adirondack chairs are also painted in this red accent colour as well. Inside, the same yellow on the exterior is continued on the walls, and they've also done all of the accents in this colour as well. The central area of the home is dedicated to the living room area, a small dining area and the kitchen. In the kitchen, there is a full sized stainless steel fridge with a built-in range as well as a microwave and a convection oven. You'll also notice the ladder in the central living area which leads up to the loft bedroom where there are two twin beds positioned on either side of the room. There is also a main floor bedroom as well, at the back of the home and it has its own small private bathroom. Another great addition to this little house design is the carport that's attached to the home with an entrance into the home. A small house design like this shows just how practical a more modest floor plan can be and how creative you can allow yourself to be with the design. This tiny house design almost looks like it could be a tiny house on wheels, but it's actually not. That means that the floor plan can be double the size of a tiny house with more room for furniture. 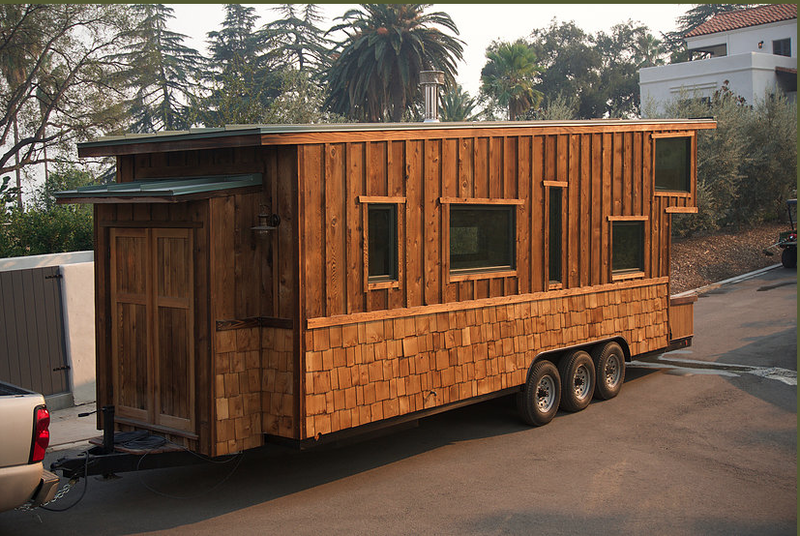 Typically, tiny houses on wheels are only able to be about 8.6 feet wide due to highway restrictions. But if a home is built on a foundation, it can pretty much be any width the customer wants it to be. The Modern Cabin has a slender profile, which is what adds to the highly contemporary look. The overhang from the roof extends out to the patio on the front making for a great covered outdoor area. There's also another little covered patio on the side of the house as well which also creates another entry point into the home. The central living area of the home consists of the living room and kitchen area with a dining area too. The kitchen is beautiful and open with a countertop that borders on the living room. All stainless steel appliances are full sized units which makes for a great cooking experience, and the sink is an extra deep stainless steel sink. The bathroom in this tiny house design may be small, but it has a lot of great style packed into it. They kept the wood tongue and groove walls in the bathroom but also added some stunning black tile in the shower area with some other black accents that really pop. The bedroom in this design is also a must-see space with generous clothing storage. This comfortable poolside cabana looks like it belongs at a resort. 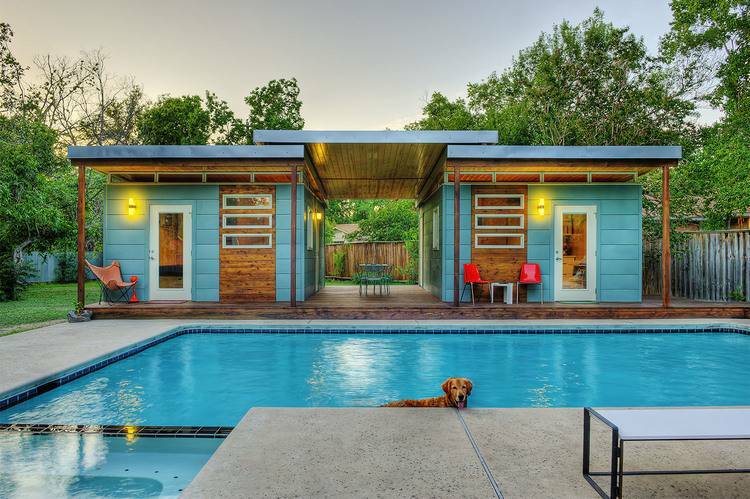 Placed on the owner's property right by their pool make this place its own little retreat. The small house design serves as a guest house in addition to the main house on the owner's property, which is an excellent alternative to creating an addition to a home. The double cabana consists of two separate units that are connected by a breezeway which acts as a little covered patio. Perfect for rainy evenings or days when you still want to be outside. Each side of the cabin features a bed, a small bathroom with a shower, sink and toilet as well as a closet. One of the cottages also includes a small kitchen that would be fine for making basic breakfasts or simple meals. There's an apartment sized fridge to store fresh produce in, as well as a microwave and a toaster oven for simple cooking. The two cabins each have their own covered patio as well and have access to the pool out in front. The tiny house design is one of the many stylish modern cabins Kanga Room Systems has available in their collection. Each of the cottages is built with attention to detail, and they are all quite affordable as well. They all have a midcentury modern yet contemporary feel to them which is a timeless and very clean look. These could be the perfect addition to any home since they will design the tiny houses to match the existing home on the property. Instead of building an extension onto a home, many people are liking the idea of building a tiny house on their property instead. 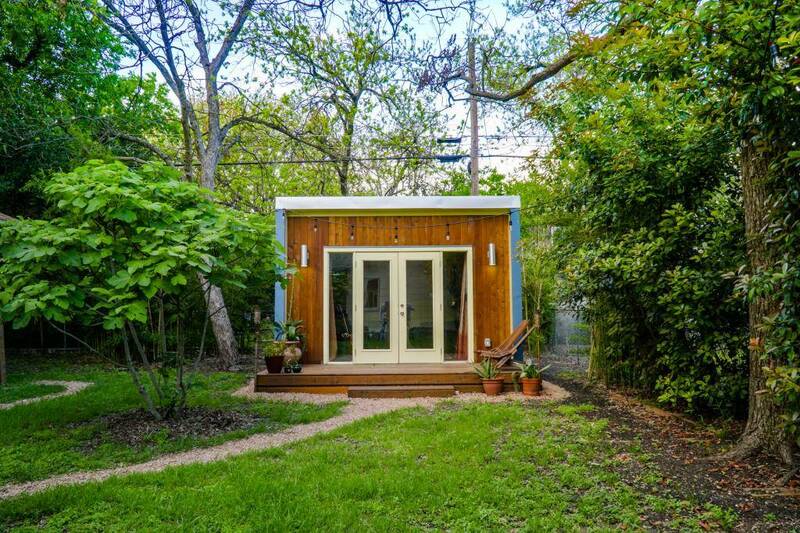 These are also known as accessory dwelling units, and they are buildings that can be used as office or studio spaces and temporary dwellings. This is one of the great tiny house designs from Kanga Room Systems, and it's a great example of how the company can create a tiny house to match the existing home design perfectly. The existing home, in this case, was painted a bright red colour which might be pretty hard to match, but the company did a great job of matching the paint colour just right. They also added some wood and slate grey accents which also modernize the look of the home. In this case, the tiny house design is being used as office space and a music studio for recording and practice. The space is basically just one room that has enough space to fit a desk for a laptop and a monitor and then enough room to store musical instruments and gear. The three small windows are a signature design feature of Kanga Room Systems, and you'll find them in just about all of their small house designs. These windows along with the other windows and the pane of glass in the door help to brighten up the small space and make it feel more open and spacious. A small room like this is sometimes just the perfect amount of extra space that people need to make the best of their property. This cheery cottage is a one of a kind design from Kanga Room Systems. The colourful tiny house design is one of the company's larger options at 972 square feet, but they built units as small as only 100 square feet. The exterior of this home is decked out in some bright paint including a beautiful blue with a vibrant sunshine yellow for a very unique look. The impressive porch extends the length of the home with a section that wraps around the home with a screened in portion. There are also a ton of windows all around the home making for a beautiful, light-filled space. There is only one photo of the interior, but there seems to be a lot of space within the home. Enough space for a small grand piano in the central living area of the house as well as a large family dining table. They also brought some of the colour inside the home by painting the inside of the door yellow as well. The walls are kept neutral with a cream coloured paint, and there are little pops of colour everywhere including with the light blue dining table and chairs. This small house design has enough room for a family to live full-time or to use as a vacation cabin. 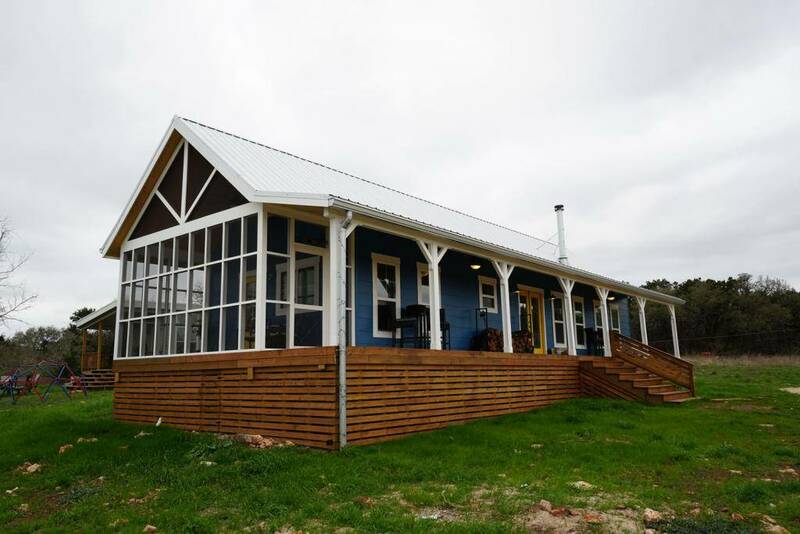 This could be the perfect starter home on a newly purchased property out in the country as it would be quite affordable to build and it's a practical size to start with. It doesn't get any cuter than this small cottage design. Incredible Tiny Space That Fits Fireplace, Full Sized Kitchen And Much More! 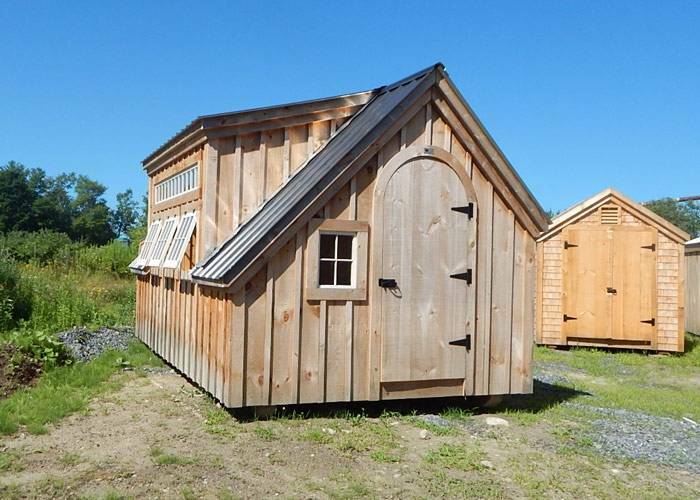 Practical and affordable, these cabins from Jamaica Cottage Shop are perfect for many purposes. They are especially wonderful for those looking for a rustic cottage design for a vacation cabin or a ranch house. The simple designs create some very cozy and comfortable spaces and then the customer can put all of their own finishing touches on once the structure is built. Shown here are a variety of their different designs from a small cabin to a large double level home. Either with a front porch or balcony on the front or a large deck built on. The porches are beautiful since they're covered which means that they can be used even when it's raining. The home designs can be built on basement foundations to add some more square footage without having to build out and expand the footprint. They can also be built on stilts or on a flat concrete slab foundation. The finishes and decor are up to the client, and as you can see, the rustic style of decor always suits a rustic style cabin. The decor could also be very modern as well, painting the walls white and having some very modern and stylish furniture with stainless steel appliances in the kitchen. Any of these would be great for a cottage in the woods or a lake house; they could even be great starter homes or dream homes. You can see the large selection of designs here and more on their website to see which style you like the best. Smaller cabins and sheds like these can be convenient for a number of different uses. For example, since they are so easy to build, people will build one of these small cabins in their backyard to use as an office space or as a guest suite. It's much easier to build one of these smaller units than to build a whole new addition on to an existing home. 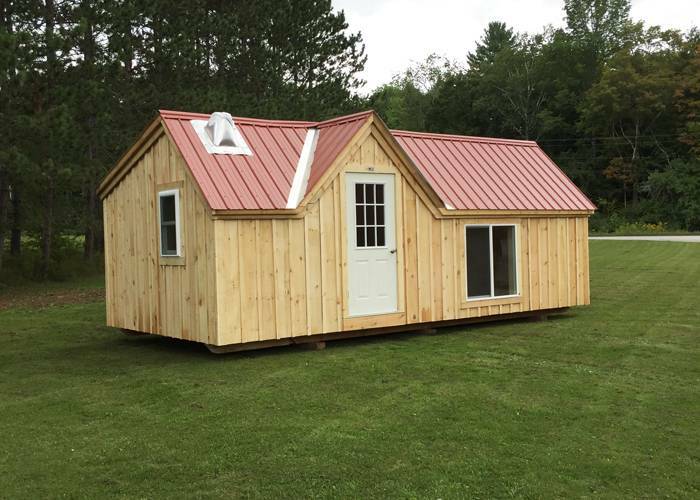 These particular cabin designs from Jamaica Cottage Shop can be built to the customer's specifications so they can use it for whatever purpose they have in mind. A smaller build could take as little as a week while the larger more complex ones take longer. You can see the different design ideas for these cabins including one that's being used as a quaint cabin, another one that's being used as a storage building and one that's being used as a food stand. 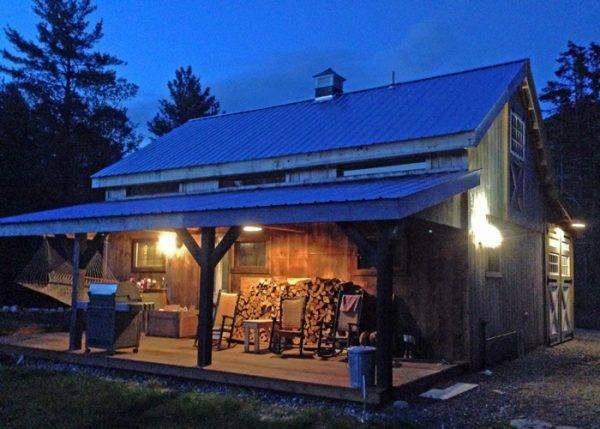 All of the small cabins built by Jamaica Cottage Shop are built out of the highest-quality wood for superior strength and durability as well as longevity. They all come with the windows and doors that are included in the chosen floor plan and can have different items added on like cabinetry and furniture. Customers can opt to paint the wood as you see with the grey painted cabin with white trim, or they can choose to stain the wood and seal it. These cabins show how easy it is to get that extra space you may need without having to do a considerable home renovation. 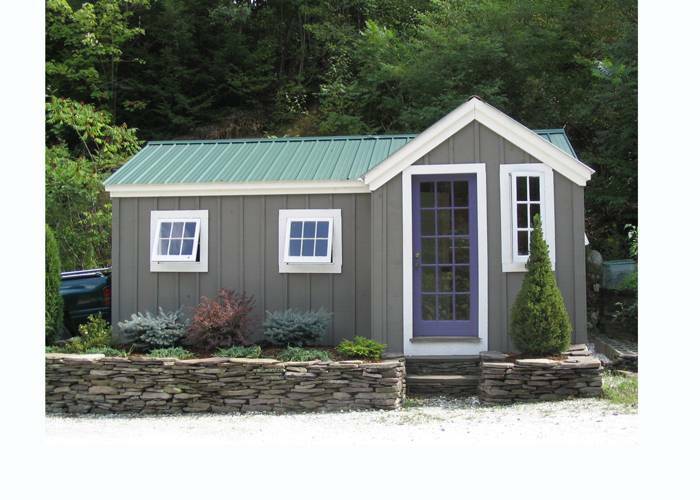 Here is an excellent example of a very simple tiny house design from Jamaica Cottage Shop, an expert cabin builder. The entire house is constructed from the best quality wood using handcrafted building techniques for a rustic cabin look. As you can see, the tiny house exterior can be left as is with the wood grain showing or it can be painted to add some more personality. One of the tiny houses looks fresh and inviting painted a lovely white while keeping some wood accents in the patio beams and the wood door. 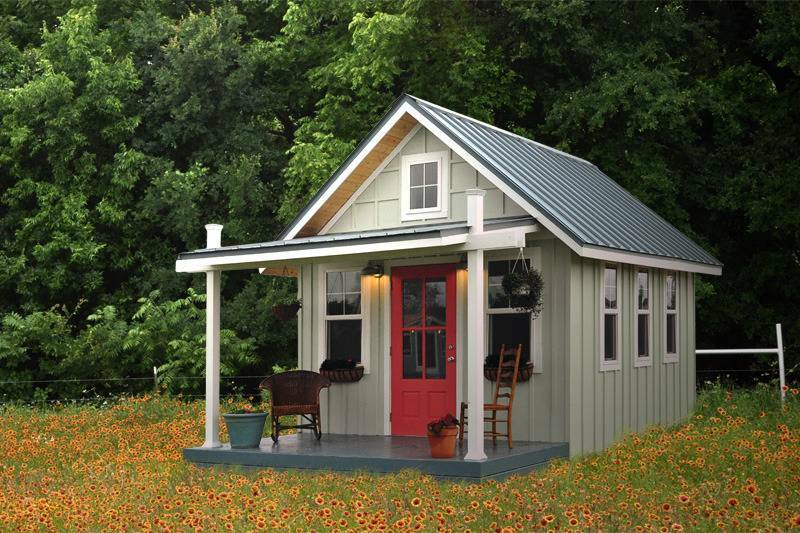 Each of the tiny houses with this design also come with an attached porch which makes it really simple to have an outdoor area without having to build something every time the tiny house is moved. The interior isn't completely finished in the photos, but you can imagine just how cute it would look completely furnished. A small bench sofa could fit perfectly in the front, and maybe a small flip up table by the kitchen could fit in as well. The kitchen is smaller, but a stove or a fridge could possibly fit beside the sink area. It could also use some shelving above the countertops as well to store plates and other dishes. In the central living area, there's also a Dickenson Propane Heater which is a trendy choice for tiny houses on wheels. These little units can heat up a home surprisingly well considering how small they are. This tiny house design also features a loft that's accessed by a ladder and a bathroom at the back of the home. There are a couple of different options for the floor plan, and customers can also change the floor plan to suit their needs. The Cross Gable Cottage is a unique design because of its interesting roof line. The cross gable roof makes for a beautiful star-shaped roof that is visible on the inside of the cabin that also creates the feeling of more headspace within the cabin. You can see various adaptations of this small cabin design created by Jamaica Cottage Shop where they either leave it to be a rustic wooden cottage or even a very Victorian style cottage with scalloped siding. These designs show that even though you use a certain model for your own cottage or home, you can change up the style to suit your own. One of the adorable cottages is painted a light grey with white accents and an arched door to give it a very English look. Another one of the cabins is painted black on the exterior with a deep red door for a very dramatic appearance that somehow pops with the forest as a background. Other cabin designs are left with the wood siding with a stain, or a protective coat applied so that the wood will persevere over the years. These small cabin designs can be built on a concrete foundation once they are delivered to the property, or they can also be built on stilts to keep them up off of the ground. Most of the homes are built in the company's factory and then delivered to be placed on the foundation, or they are built in stages, and then the parts are delivered, and it's re-assembled on site. With so many options that look incredible, it's hard to know which one to choose. Who knew that such a simple design could be so beautiful? This 16 foot by 48-foot wood cabin from Kanga Room Systems is one of the many options from the company who builds these impressive small homes and cabins. Each cabin can be built specifically to the customer's needs and preferences making each one different and one of a kind. 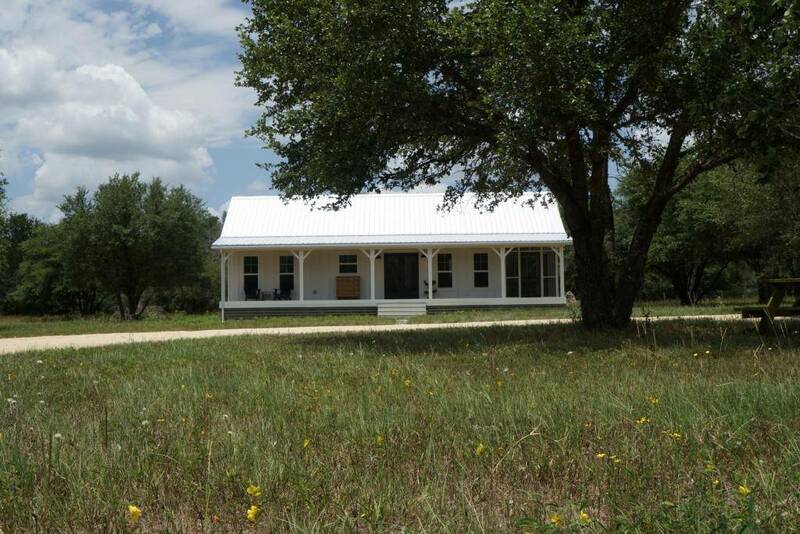 This one is built on a lovely pasture, and the style of the cottage fits in so well with the natural surroundings. Usually, Kanga paints their cottages and small homes very bright colours, but this one is a bit more subdued this time around. With a lovely grey on the siding and a deep purple door, this one makes a statement without being too much over the top which is perfect for people who prefer subtlety. On the porch, there is a lovely swing that's built right into the awning, perfect for enjoying a nice glass of lemonade on a hot day. They've also included a dining arrangement to show that this could also double as extra dining space in the summertime. Inside, the home is just as charming as it is on the outside. The vaulted ceilings make a big impact on the overall feel of the home, drawing the eye up and making it feel more expansive. The central area of the home is dedicated to the living room, kitchen and dining room with a bedroom tucked in behind. Then, it seems like there may even be more bedrooms and a bathroom on the other end of the home as well. 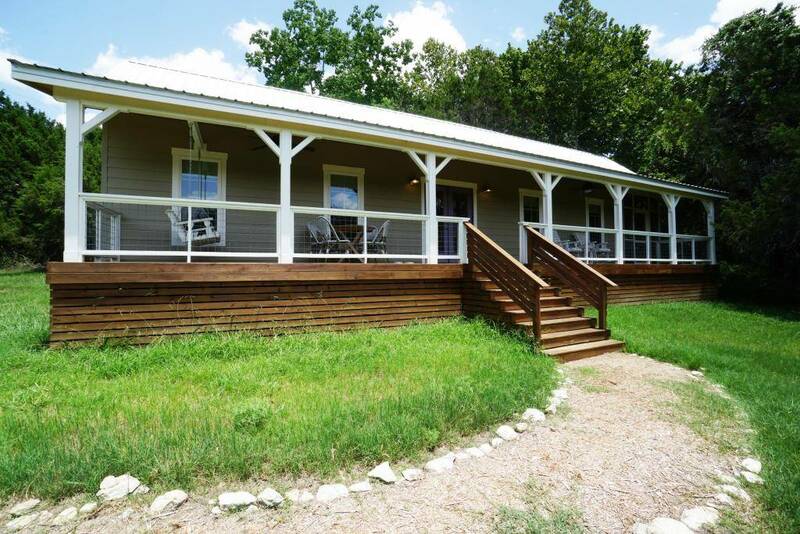 The charming home is a total of 768 square feet which is great for a starter home or a cabin. For those in need of a quiet artist's studio, this Modern Studio called the Artist's Delight from Kanga Room Systems might just be the perfect fit. This company specializes in building small quality buildings including studio spaces, guest houses, rentals, vacation homes and tiny houses. Each of their homes is a little bit different than the next since they work closely with their customers to bring them exactly what they need. This sweet little studio space looks so beautifully modern on the exterior with a grey siding and a bright orange door to welcome you in. Inside, the walls are painted white to keep the space feeling fresh and neutral so as not to clash with the artwork being created in the space. The space is large enough to accommodate a desk, a comfortable chair and stool as well as a sink and some storage. The sink is a must for an artist's studio so the artist can wash off their brushes and clean up after some painting. It's also very convenient that there is a bathroom with a shower in the space as well. All they need is a bed, and they could spend the night when the creating goes late into the evening. A space like this one could also be wonderful for a photography studio with a dark room built in for traditional photography and a framing station. Some people use these spaces as office spaces as well which is also an excellent idea for those who want to separate their work and home life. Stylish, colourful and modern, this cabin compound from Kanga Room Systems has so much to offer. Shown here the grouping of modern cabins is used to accommodate several guests in the same area with common spaces to enjoy time together. All of the buildings share the same colour scheme and style which creates a cohesive look. They are all painted blue with natural wood accents which makes for a very fresh and light appearance. All of the units feature lots of windows and multiple entrances which makes for a light-filled space. There is also a common space outside where the guests of the cabins can come together and enjoy some outdoor time, but when it's time to sleep, everyone has their own space to retreat to. In the larger units, there are also common games areas where guests can hang out and play games together; there are also bathrooms in the larger units as well complete with showers, sinks and toilets. These cabin compounds could be used for a variety of purposes such as a camp, guest rooms for a private property or even as an office space. The designs of these units can also be changed to suit the customer's preferences, and the colours can be adjusted to match the existing home. 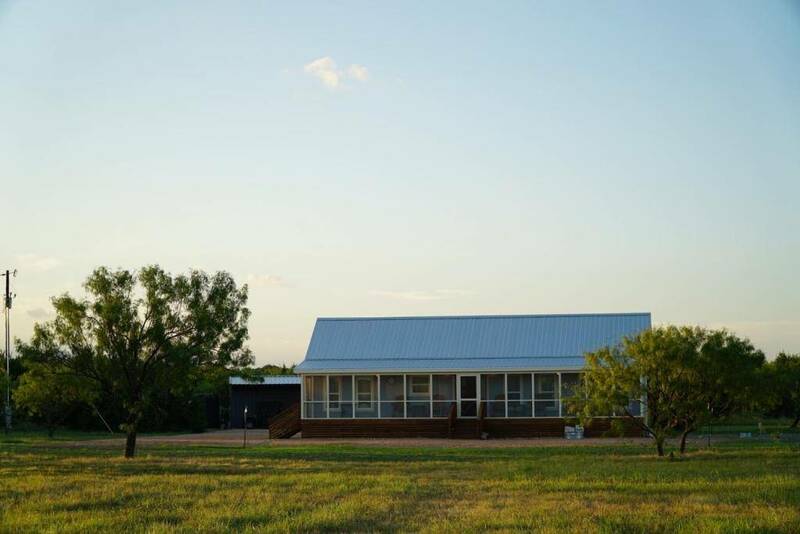 This Modern Cabin Compound appears to be on a ranch where extra accommodation may be needed for different retreats held at the ranch or for the owner's visiting family members when they come out to the ranch to visit. For all of you that want a little piece of paradise out in the countryside, this cottage could be a dream come true. What is it about small house designs like this that bring so much peace and relaxation? Maybe it's the simplistic nature of the design or the fact that it's surrounded by beautiful trees and wildflowers. The perfect setting for a sweet cottage like this one. The model is created in a classic and traditional country farmhouse style, with a lovely little porch on the front complete with a rocking chair. Through the bright red door, you'll see that the interior of the cottage is just as lovely as the exterior with wood flooring and white walls. They kept the door red on the inside as well for a pop of colour and went with a sage green colour for the trim and accents. The light fixtures drop from the vaulted ceiling making an impact on the room and allowing for the right amount of light in the space. With 768 square feet of space in this cottage, there would be more than enough space for the main floor bedroom as well as a bathroom or maybe even two bathrooms. Customers can usually apply their customizations to each of the different models to make them match their own style and needs. 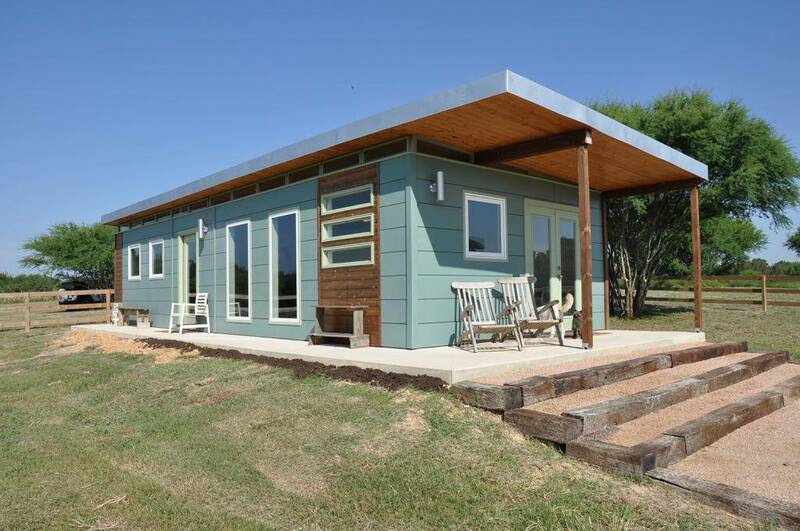 The unit would be the perfect vacation home or even a little starter home on a farm for a small family or a couple. Is this a small space you could see yourself getting comfortable in? Sometimes all you need is a little bit of extra indoor space on your property. When a home doesn't have enough space, it's a trending idea to build a second unit instead of building an extension onto the home. That means skipping all of the planning, renovation dust and commotion it causes a household. Alternatively, a whole new building gets to be built and often, with smart building solutions like these small cabins, the building can be ready in as little as a month or so. This Modern Studio Luxe from Kanga Room Systems is one of the many building solutions for those looking for some more indoor space. This particular model is 16 feet by 20 feet, and it looks incredible on the owner's property. The modern design and style of this small unit fits in really well with any other conventional housing in the area, and it could really even upgrade a property. The exterior is done very simply with light grey exterior siding and wood accents. The French doors a painted a slate grey or almost a black colour which really draws the eye toward the entrance. Since there are panes of glass in the French doors, the light inside the small cabin is abundant. Plus, the three small windows to the side of the door, and all of the windows at ceiling height also really help to bring in the light. The interior is finished with wood on the floors, walls and the ceiling which looks really warm and cozy, and there' seven a bathroom included in this floor plan. 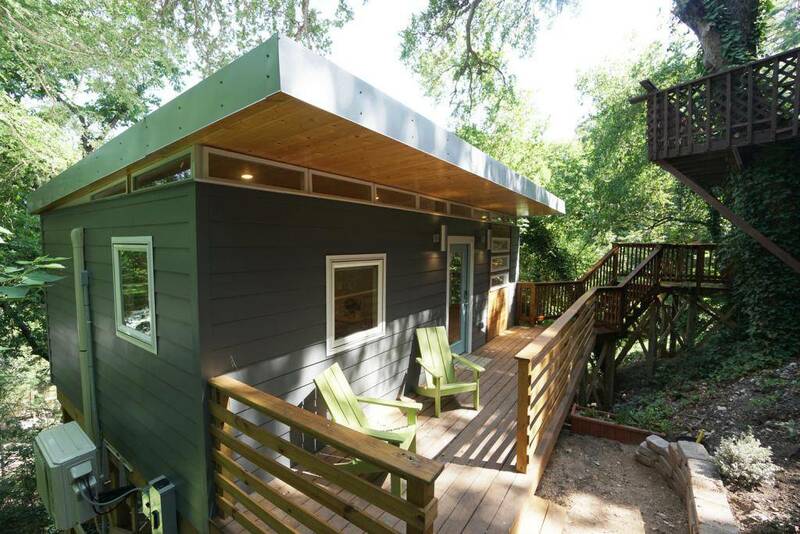 A permanent tiny house in the trees, the Modern Dwell is a 16 foot by 26-foot design from Kanga Room Systems. This small house is built onto the side of a hill and is accessed by a beautiful wooden staircase that winds down the hill. There's also a deck on the home leading up to the front door which features the signature three narrow windows to the side of it, a common design choice for Kanga Room Systems. From the outside, the home may not seem like much, but on the inside, there is a lot to appreciate. There is one large common area in the home that holds space for the kitchen, living room and dining area. Keeping the furniture very small and minimal helps to balance the space and keep it feeling open. The kitchen being all against the one wall also helps with maintaining a very open feel to the centra space. There is even a double door fridge and freezer as well as a full sized oven and range with a microwave over top. Cabinets encase the entire kitchen set up providing lots of storage which is always essential in a tiny house. For dining, there is a small bar and barstool set up which would be comfortable for two people. For larger meals and gatherings perhaps a more extensive table could be brought in with some extra chairs. Beyond the kitchen and living room area is the bedroom and bathroom meaning that this small home has everything needed for simple small house living. Simplicity at it's best; the Piedra Blanca shows that you don't have to get too fancy when building a tiny house. The small house design was created by Humble and Handcraft a builder located in Ojai, California. The company prides themselves in using recycled and reclaimed materials. So all of the wood you see on the exterior of this tiny house was reclaimed for a more sustainable build. If they do use new wood, they make sure to only buy it from sustainable sources. All of their units are also built solar power, and they can build these buildings anywhere, even off-grid because they only use solar power to build them. They can also install solar panels in any of their tiny house projects, and they use sustainable and green appliances in the homes as well. So for heating, this tiny house will have a wood burning fireplace in it. Appliances are all run off of alcohol which is one of the cleanest fuels right now. Using proper insulation and windows in their projects also makes a big difference when it comes to keeping the places warm in the winter and cool in the summer. You'll also notice cool details like the handcrafted wooden door and the little piece of stained glass in the window above the door. It's touches like this that personalize a home and make it feel unique to the owner. This unit was built as a shell, so the owner was then responsible to finish off the interior themselves. This creates the perfect opportunity to have a hand in building your own small home. A tiny house on wheels from Humble and Handcraft, the Tomahawk shows what a stylish, environmentally friendly and economic tiny house looks like. The Tomahawk measures 12 feet long by 8.5 feet wide and 10 feet tall making for a super small home that is easily transported. That means that this tiny house on wheels would be the perfect travel trailer or an excellent option for those who have to be on the go for work a lot. 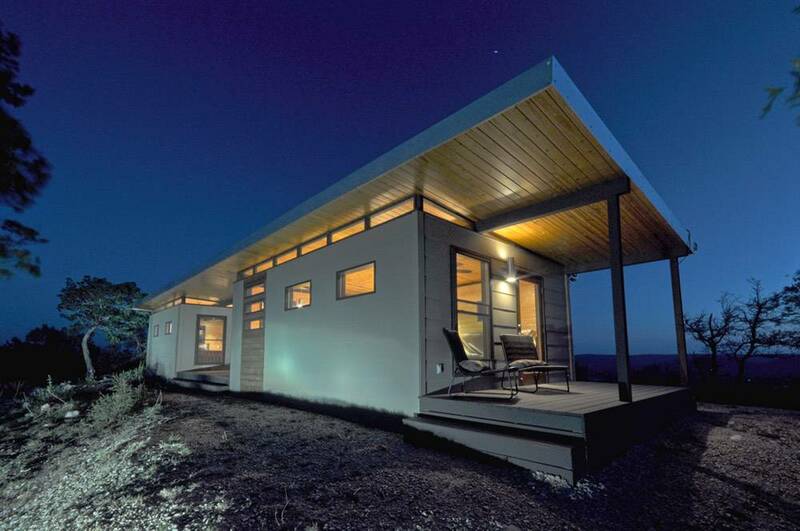 The lighter the tiny house is, the more flexible you can be. 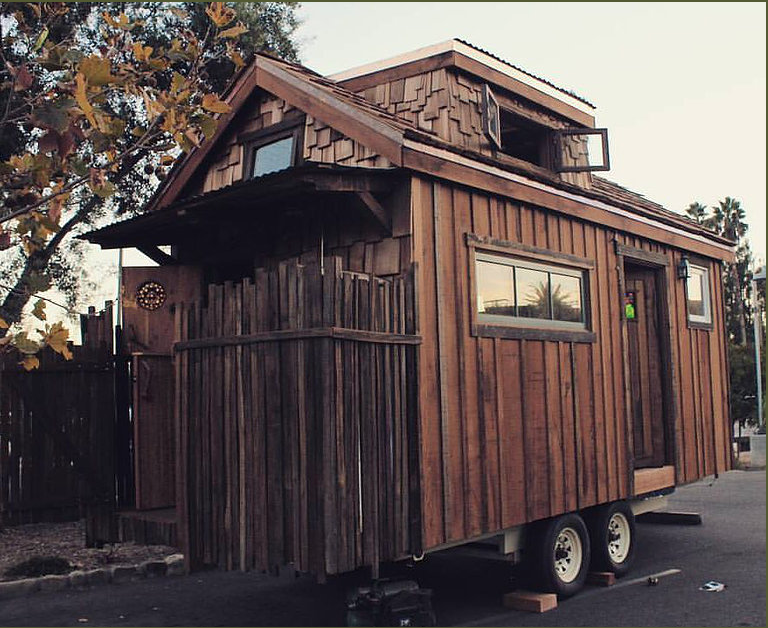 Humble and Handcraft uses a lot of recycled and reclaimed materials in their tiny house builds. 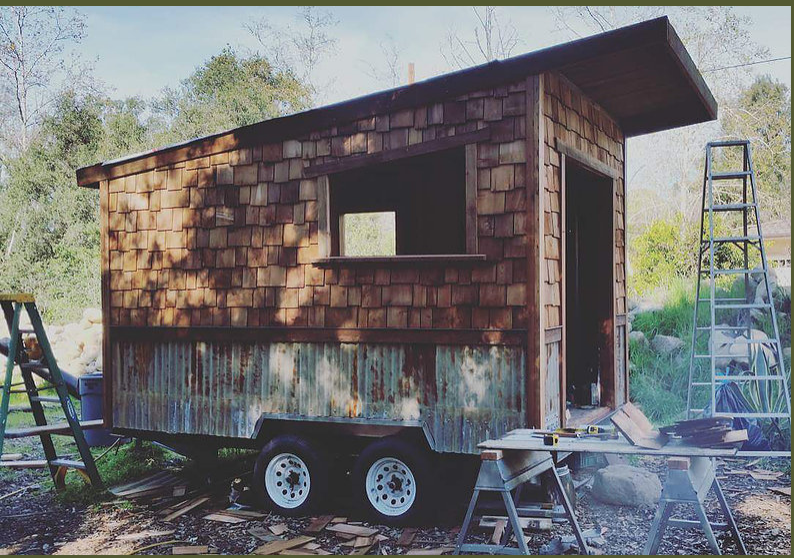 So on the exterior of this tiny house, they used reclaimed cedar shingling and reclaimed corrugated steel on the walls, reclaimed redwood and cedar on the trim and fascia, and some standing seam metal roofing. It's quite impressive that the company handcrafts most of what you see here and they even fabricated the wood burning stove with an oven and cooktop for this one. The tiny house is built on a goose-neck double axle trailer which was created by Zieman in Los Angeles California, and it's strong enough to carry the tiny house and any weight inside of it. A home like this one shows that even if you're on a budget, it's possible to build a tiny house that looks great. By using reclaimed materials money can be saved, and also natural resources are spared as well. 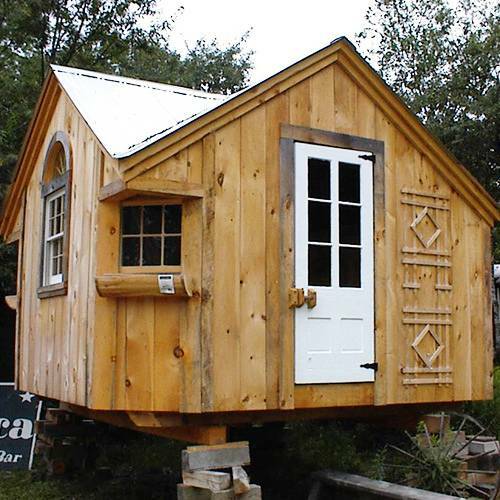 Think of how many tiny houses could be built using just scrap materials alone. 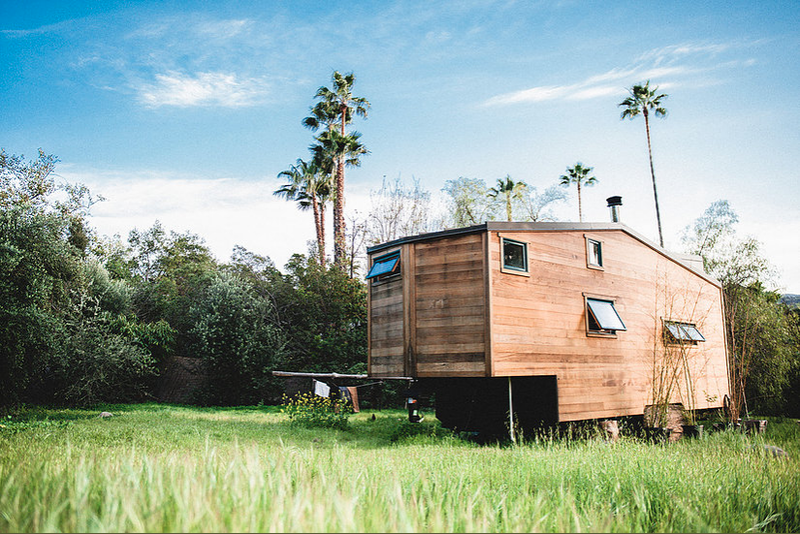 Sustainability meets style in this tiny house design called the El Toro built by Humble and Handcraft. The model is one of the company's larger tiny houses measuring 28 feet long by 8.5 feet wide by 13.5 feet tall. With all of this space, a couple or even a small family could live comfortably in this home. On the outside, they used reclaimed wood as the siding as they usually do, but for this house, they used an ancient Japanese technique called Shou Sugi Ban on the siding. The technique requires that the wood is burned which creates a protective layer in place of a finish, and it creates a deep dark colour on the wood siding as well. A utility closet was also created on the exterior which holds the tankless water heater, a generator, an inverter, a water softener, a water inlet, an electrical inlet, and a solar inlet. On the inside, they also carried the reclaimed cedar wood throughout, but they did some skim-stone walls as well. For the surfaces and countertops, they used some beautiful old growth redwood slabs. The couch was also handcrafted and features generous storage space, and there's also a dining table that can be converted into a bed. The kitchen in this home is wonderful, with a large fridge and a deep sink, there's also a laundry unit in the bathroom area too. As with all of their tiny house designs, they installed a wood burning fireplace for heating, and you have to admit there's nothing quite like a wood burning fire. For many people, a luxury tiny house on wheels is a dream come true, but not in their price range. 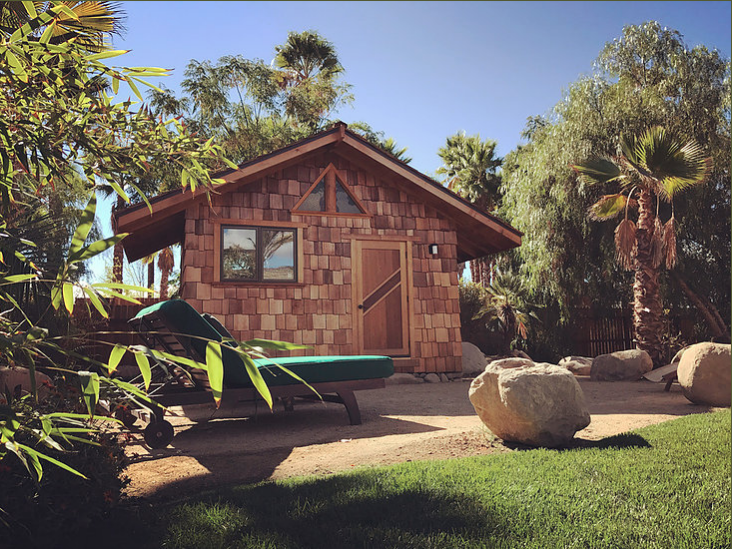 For those looking for a more affordable option, Humble and Handcraft, a tiny house builder located in Ojai, California, has some great models and ideas. The company uses mainly reclaimed and recycled materials in their building projects. Not only will this make the build more affordable, but it will also help to reduce the use of natural resources. Instead of using new materials, they use materials that can have a second chance. You can't tell by looking at their tiny house designs that the materials are all reclaimed. They handcraft every aspect of the home, paying attention to every detail and making sure everything works and looks great. On the exterior of the Los Padres model, they used recycled western red cedar for the siding which looks stunning. Cedarwood bought brand new would cost a fortune, but since it's reclaimed that price could be cut in half. They also included a 5 foot by 8-foot front patio made out of cedarwood and aluminum. Inside, the tiny house is as cozy as can be with a wood burning fireplace that also saves energy and money over time. Since they insulate all of their tiny houses optimally, the heat stays in the home really well too. You will also notice the tile surrounding the wood burning fireplace that adds just a bit of colour and some personality to the interior. It's little personal touches like this that help to create a cozy and comfortable atmosphere. The Chief's Peak is a classic little tiny house design from Humble and Handcraft tiny homes measuring 20 feet long by 8.5 feet wide and 12 feet tall. 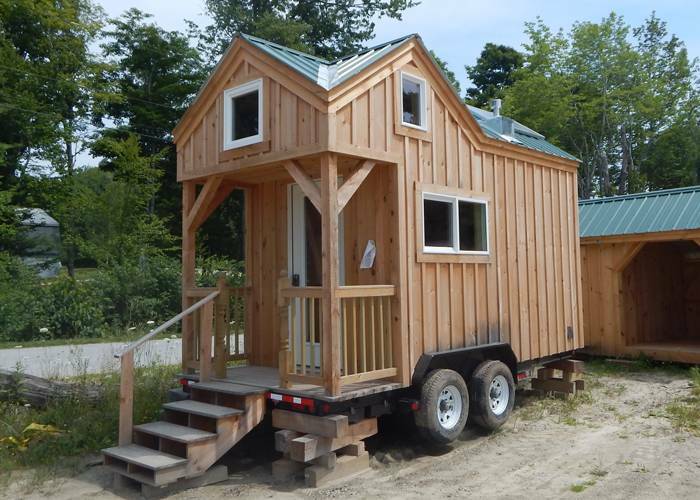 This is a great size of a tiny house to take travelling or to have in the yard as a guest house. The great thing about this company is that a good majority of the materials they use are all recycled and reclaimed. The siding for the Chief's Peak was all reclaimed redwood board-and-batten style siding. Most of the windows were handmade using old growth redwood and insulated glass panes. Instead of using toxic finishes they used a hemp shield to finish the exterior materials. All of the interior finishes are done with various types of wood including old growth redwood, cedar, and pine. The building is insulated using sheep's wool for a natural option. All of the shelving and the counters were made from a cedar tree that was collected from a local fallen tree. The kitchen is a nice size for the tiny house with lots of great tiled countertop space. There could be space for a small fridge and mini appliances for a minimalist style kitchen. The wood burning fireplace is rather impressive as well and looks like it was also an upcycled find. Up a ladder is the loft space which holds a comfortable mattress and has plenty of windows and a skylight to let light in. 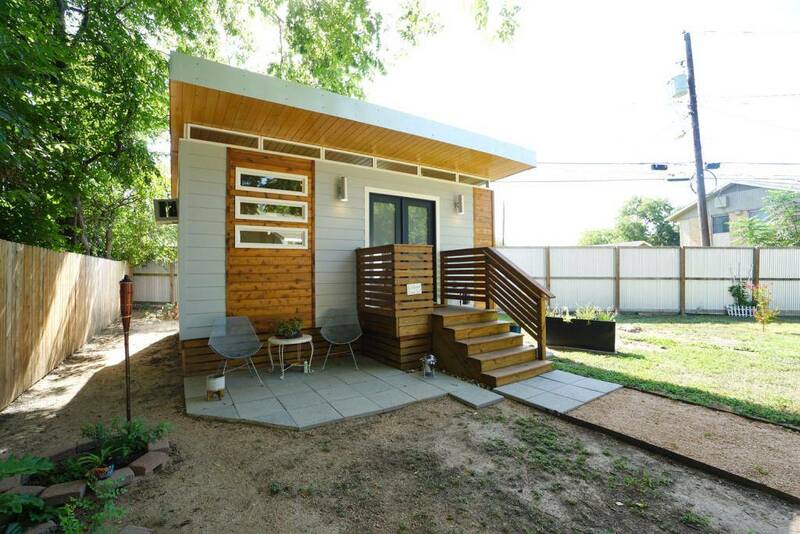 It's also great that this tiny house features two entrances instead of the usual one entrance. What an inspirational small house design. 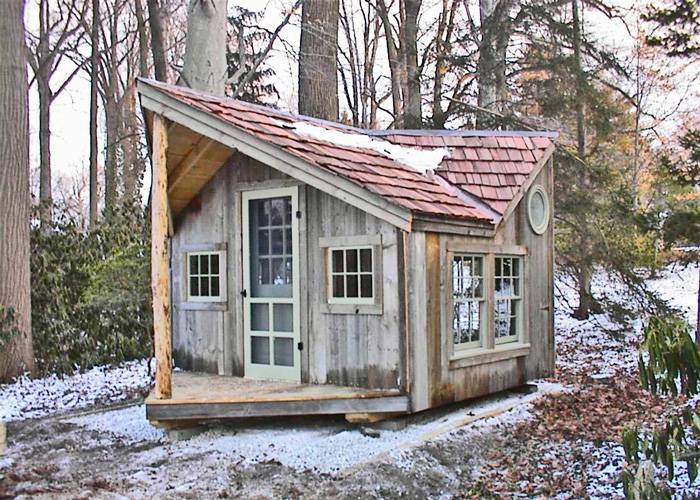 A sweet tiny cabin, the Nook Cabin from Jamaica Cottage shop could be the perfect backyard shed, playhouse or guest suite. These small cabin designs can be used for many different purposes, so even if one is built to be used for a specific purpose at the time, that purpose can always change over time. 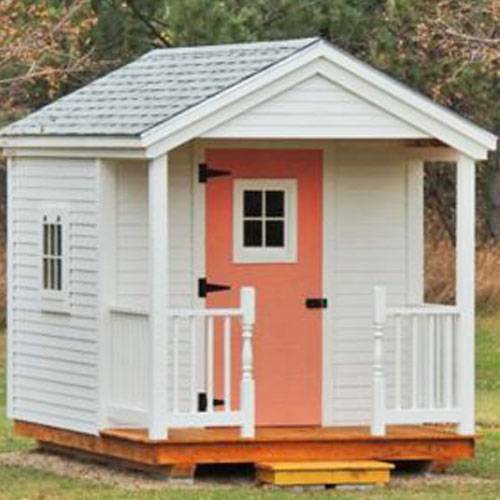 You can see one of the models painted white with a peach coloured door, which could make for a great kid's playhouse or even a craft space. The other idea is to build the model on a trailer and use it as a tiny house on wheels. The exterior of this home was painted white again, with a sunny yellow on the door. The model also features a small front porch which they also kept for the home on wheels. Most of these smaller units are built in the company's factory and then delivered to the residence to be placed on a foundation. Either a concrete slab foundation or a simple platform foundation will work. Inside, the tiny house is finished but left bare to be furnished and decorated. Some of them include shelving and storage, while others are just left open for the customer to complete however they like. Adding a convertible sofa would be an excellent option for a guest house while adding a simple desk and chair could be great for a home office space. There is also the option of using these wooden buildings as dry saunas too as you'll see in one of the photos. So really, the possibilities are endless. 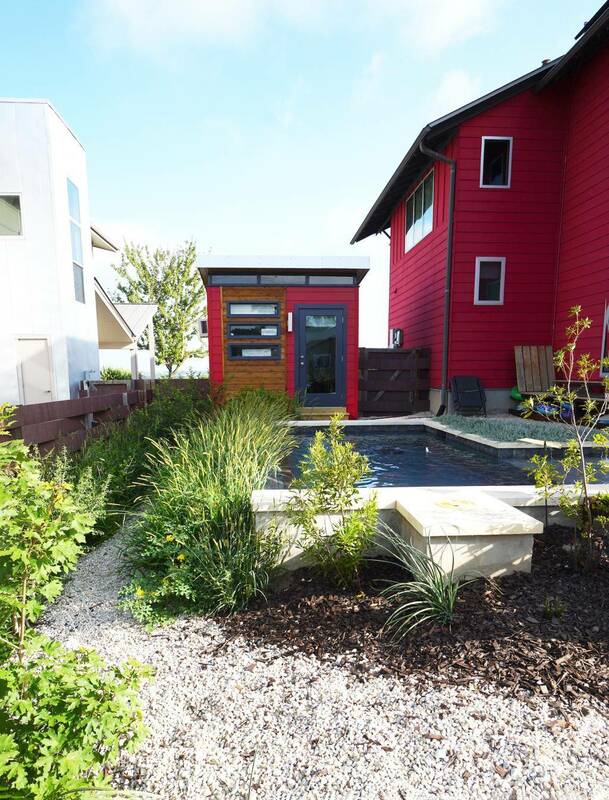 With a very unique design, the Backyard Retreat is the model for those wanting something a little out of the ordinary. This isn't just your typical A-frame or simple conventional style of wood cabin, this one has a style all it's own. With a peaked awning and roof on multiple angles of the cabin, it looks very geometrical in shape. This also creates some interesting lines on the inside of the cabin as well. The ceiling is peaked, offering more head space in specific areas which is always a good thing in smaller spaces. The interior is left unfinished in this cabin which gives the new owners a chance to finish it the way they like. Painting the walls using some white or light coloured paint would freshen up the interior and make it appear larger. The windows also help to make the interior seem more spacious too. You can see that on different builds, they used different windows, doors and materials for the build too which makes each project unique. For one, it seems as though they used old wood, windows and doors from an older home for a more rustic, country look. For others, they used brand new wooden siding and new doors and windows for a fresher look. It's also impressive to see all of the details in the home and all of the craftsmanship that went into creating the sweet cabin. This cabin could be a great fishing or hunting cabin as well as a cute little summer cabin for a single person or a couple. This cottage from Kanga Room Systems is a dream come true and with it one of their Kwick Rooms to match. The country cottage is very simple in its design, and there's nothing too fancy about it, but there is a simple kind of elegance and charm it holds. The welcoming front porch is a big part of that, with the beams going all the way across and the Adirondack chairs waiting to be sat in. As for colour schemes, this is one of the simplest for Kanga Room Systems, but it's so classic and stunning. They went with white for the exterior siding, the trim and the roofing which will help to keep the home cool in hotter weather. Then, for accents, they went with black for the door, lighting and the chairs. Inside, the minimalist design continues with white walls and wooden floors to warm the space up. The living room area shares space with the dining area, and the kitchen is tucked off to the side, yet still open to the living area. They went with striking darker cabinets and butcher block counters with handmade industrial style shelving. Behind the kitchen and bathroom is the bedroom which is a very open and generous space. It also includes two closet spaces with double doors and enough room for dressers too. Another nice feature on this home is the large screened in patio on the side of the home which is especially great on those hotter nights. 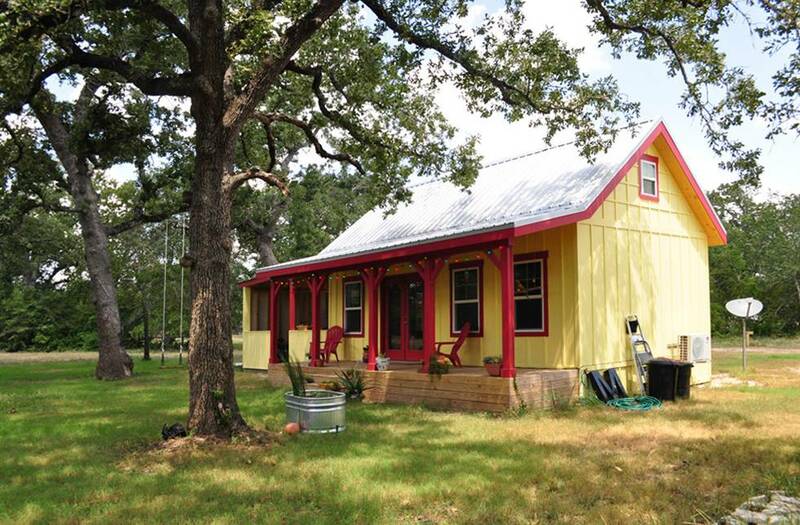 This country classic is a true gem of a small house design. Always dreaming of having your own home music studio? This detached music studio is a great idea. Instead of having a music studio inside their home, these homeowners decided to make a separate space to practice music. It's a great way to prevent a lot of noise inside the house as well because even with the best soundproofing, the sound is still bound to carry through the home. The Modern Kwik Room Lite is 12 feet by 14 feet which offers just enough room for a couch and music gear. Of course, the building could be used for other purposes too like a home office space, an art studio or even a private guest room. The exterior looks super modern with the corrugated metal and wood siding. There are French doors and two windows the same height on either side of the door to make the entrance feel grander. This also allows a lot of light into the small space which helps to make it feel more spacious. With the convertible sofa in this unit, the owners could use the small space as a guest room too. Just fold out the couch into a bed, and people can stay the night. The unit comes from Kanga Room Systems, a company based in Waco, Texas. They make a variety of small backyard building like this one as well as tiny houses and cabins too. Their designs are always modern and stylish, and they build very affordable and durable spaces that make a difference in people's lives. Affordable and high-quality, the Xylia Cottage from Jamaica Cottage Shop would make a very cozy vacation cabin. The home is built using high-quality wood in a traditional cabin building style, plus it's made for any kind of weather. So whether you want a cabin somewhere warm or somewhere that reaches colder temperatures, the cabins from Jamaica Cottage Shop will endure it all. The cabin is called Xylia which is the Greek word for in the woods which is a perfect place to put this small cabin. You can just imagine it in the forest surrounded by trees with a beautiful deck or patio built off of it. This model shows one single door which is what the cabins usually come with, but you could always upgrade that to be a double door as well. The cottage also includes all of the windows, the wooden walls, the roofing material and more. So what the customer gets is a finished structure that is ready to use. In this one there is also a bathroom with a toilet, sink and shower, as well as a kitchen with a sink, but no appliances are added yet. The appliances and other finishes are up to the client to do themselves once the cabin is delivered to their property. Then, they can finish the wood however they like, either by painting it or staining and sealing it. The cabins start at the low price of only $4,442, and items can be added on as needed to customize the cabin and make it comfortable for use. Whether it's a cute treehouse or a tiny house on the ground, we're all for this adorable Smithaven cottage from Jamaica Cottage Shop. This tiny house looks like a sweet little English cabin with its arched doorways and asymmetrical roofline. There is also a lot of exposed strapping on the interior which makes it look even more like a Tudor style cottage. On the exterior, the tiny house is finished with board and batten siding with windows lining the sides of the structure. In the treehouse version of the design, there is a very sturdy and easy to climb staircase which provides safe access to the tiny house yet it's still up off of the ground because it's built on a raised wooden foundation. In this case, it would make for a great playhouse or a guesthouse, somewhere to go and relax and unwind. The small house design could even be worked into a design for a tiny house on wheels too. All that would need to be done is to decrease the width of the tiny house to 8.5 and the height to 13.5 so that it fits within the highway regulated measurements. The interior is finished, but it's left plain so that the owner can then come in and decorate it as they like. Adding a small kitchen and a bathroom would be great additions. Also, painting the walls white would bring in more of an airy and light feeling. How would you decorate this cute storybook cottage? Designing a home is all about expressing personality through the decor and style of the home. This tiny house called the Apple Blossom Cottage definitely has a lot of style and character packed into its small footprint. 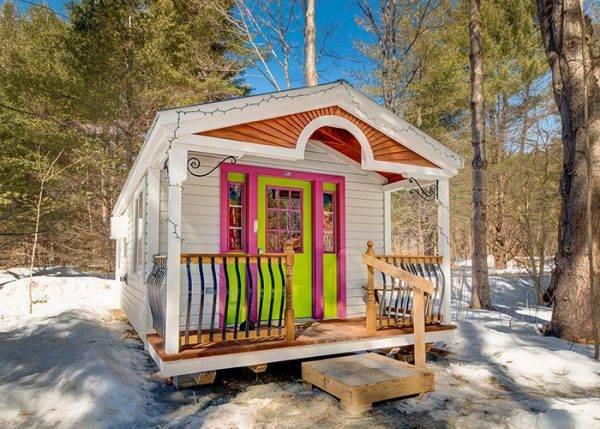 The tiny home was built by Jamaica Cottage Shop, and the customers chose the colours and all of the decor. On the exterior, they used wood siding as they usually do, but in this case, they painted a majority of it white and then did some fun accents in lime green and bright pink. Inside, the colour continues with the accessories this time. The futon sofa is bright fuschia with colourful accent pillows and an ornate rug underneath. They also made some bright tye dye curtains for the windows which match the furniture and other accents. The shelving above the windows and doors is very smart as well. It provides lots of space to store books and to put other items like plants or knick-knacks. Adjacent to the futon is the kitchen which spans the length of the wall in the central living area. There is a small fridge, a toaster and a coffee machine station on another wall as well for minimal food preparation. The bathroom includes a shower, a sink and a toilet which is all you need in a tiny house bathroom. In the back, there is a bedroom which would either have bunk beds or one large bed. They also show the small house design without all of the colour too, in a simple neutral colour pallet which also looks great. A traditionally crafted log cabin, this 10 foot by 32 foot Lodge from Trophy Amish Cabins would be the best small vacation cabin. Crafted using the highest quality Eastern White Pine and Aromatic Eastern Red Cedar all of the cabins from the company are handcrafted by talented and skilled Amish builders. Even the metal roofing is manufactured in an Amish shop, and all of the windows are made by a local company as well. This is a company that wants to exceed their customer's expectations, and they will work with customers to bring them exactly what they want and need. They build standard cabins from the models like this one, but they will also build custom cabins as well. As they're building the cabin, they will rough in the electrical, create the walls, cabinets, countertops, install windows and more. They can also install handicap accessible features. You can also see that they will handcraft furniture that matches the rest of the home's features. All the customer needs to do is buy the furniture and then decorate it however they like. All of these homes are built by the professionals and then delivered by professionals to their final destination on the customer's land. The homes can be placed on a foundation which is the customer's responsibility. Having a small cabin like this built is a much easier option than building one or getting a do it yourself home building kit. This cabin would look perfect at the lake or in the woods, and it would be the ideal retreat.